440-DST is rated 3.8 out of 5 by 41. Rated 2 out of 5 by Disappointed from Difficult to turn off water We had a plumber install a Delta Collins Chrome kitchen faucet. I hate the way the faucet is designed to turn off the water. The lever must be dead center or the water does not turn off. This often requires more than one attempt to shut the water off properly. 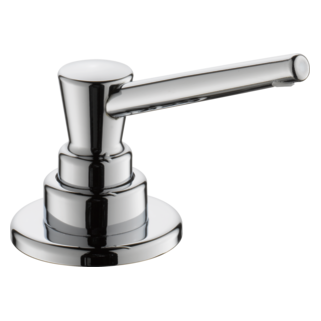 We were advised by our plumber to purchase a better faucet than what we have in our bathrooms, which are made by Pfister, model Pasadena. 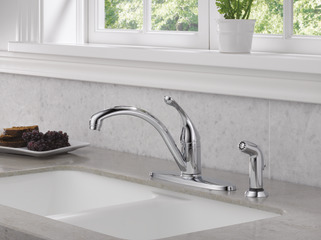 These faucets can be turned off in any position - hot or cold, no problem. Why are your faucets designed they way they are? We are replacing our counters and we are opting to replace the Delta faucet because we are so unhappy with the way it functions. Rated 2 out of 5 by MazonGrace from Constant drip Had plumber install new kitchen faucet. Put in 400 and it dripped. Came back replaced parts still had issues. Came back again and put in the 440. This is costing me a fortune. This one still drips and there is no clear off spot like the Delta faucet installed in my bathroom. As a disabled veteran I'm upset and frustrated. Called plumber and was told it's a Delta issue. Really, I don't have a lot of money and cannot afford to keep paying to have someone install a brand new product. I was told Delta is one of the best, well for me it's been nothing, but a pain. 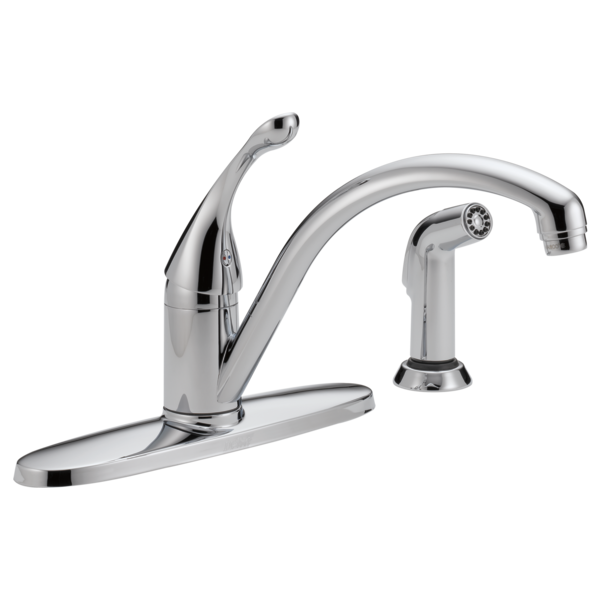 Rated 5 out of 5 by Redhead from THE best faucet we have ever owned! 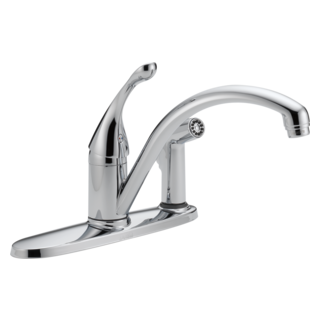 We had never had the stainless finish in our previous faucets (always chrome), this is what helped us choose the particular looks of this model. The installation couldn't have been easier, although I hurt my back just getting under our sink to see what everything looked like (I am 74 years old). We are so very happy, everything works the way it should -- first time! 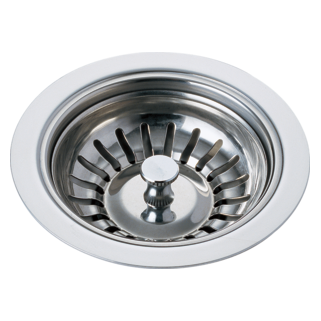 Rated 1 out of 5 by Vzert from Leaks Water from hands runs down down handle, over and under gasket RP64288 and into cabinet below sink. Cabinet stays wet under the sink. Have tried silicon sealant and plumber's putty with no success in stopping the leak. Rated 2 out of 5 by hbw125 from Things I don't like Due to the plastic construction, it doesn't feel as robust as my previous Moen faucet. It also drips after shut off. The drips eventually stop. Rated 4 out of 5 by RestoMod from Stylish but drips for almost 10 minutes This faucet is stylish and works fine... expect long service. Drips for almost 10 minutes after shut off. Contacted customer service and they are sending new cartridge and ring... hope that will solve it... stay tuned. I hope so as I paid a plumber to install. I gave it 4 stars based on Delta reputation and that the new cartridge will fix it. Rated 5 out of 5 by Matt0034 from Great inexpensive product Easy install and a solid product for the price. Rated 3 out of 5 by HandyPete from Hot to cold adjustment has issues Installed about 4 years ago. Easy install and finish is still great. Have the same issue as another reviewer, a very minor adjustment from cold to hot, say 1/4", can turn the cold water to scalding hot. We have gotten used to it but a friend almost scalded her hands when helping with the dishes. Was told by a plumber to check inside the valve to be sure everything was assembled correctly but could not get the bonnet nut off as it was too tight to budge without fear of damaging it. I hope I don't have to open to replace the valve cartridge someday. Should faucet continue to flow when sprayer is on? Can the pex supply tubes be cut and shortened by sliding the ferrill higher up further on the tube ? What's the difference between collins 441-dst and collins 440-dst? can I connect a portable dishwasher to spout? 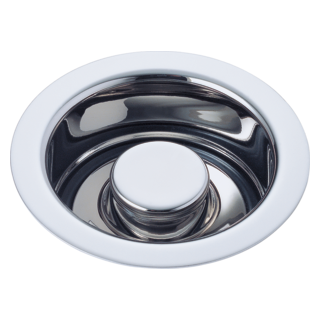 Will the spout accommodate a typical faucet-mounted water filter? I have a four-hole white kitchen sink. Can I install a soap dispenser with Delta 4040-WH-DST? How? The photo seems o show a plate over three holes, and the fourth hole seems to accommodate the sprayer. Also, is this a high-arc faucet? 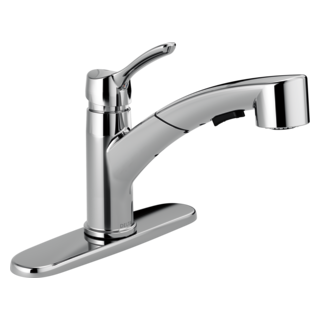 Is it a good replacement for my current faucet, Model 174? 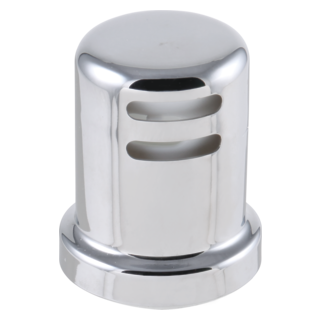 can this be used on a three hole sink without escutcheon, adding a soap dispenser in the empty hole?